In lieu of flowers family requests that donations be made to Beulah Baptist Church Food Bank, click here to make donation. Peacefully on Saturday, January 20, 2018, Alberta Elaine Tucker entered into eternal rest with the Lord. She was born on October 18, 1917, in Geneva County, Georgia to the late Charlie and Ollie Mae Williams. Alberta married the late James Arthur Tucker Sr. on September 16, 1938. After traveling through more than 28 states while James worked on the road crews, they settled in Pittsburgh, Pennsylvania around 1943. From this union came Ronald, Linda, Donald, James Jr. and later Horace (Skeeter) and Harold (Bud) joined the household. She was devoted to raising her children and taking care of the household while also doing domestic day work with her sister Amy. 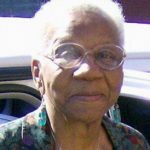 Alberta was a consummate nurturer and enjoyed being with and taking care of not only her family members but anyone who needed love. Alberta provided parental guidance to many neighborhood children like Darryl Wilson who still today affectionately refers to her as Mom. Be the first to share a memory of ALBERTA.